According to playwright Miki Johnson, she from a place called Green, Ohio, but now based in Houston, Middle America is a bleak, unfriendly place. More distressingly, the Middle America she portrays in American Falls (now on view thanks to Catastrophic Theatre) might not be limited to geographic Middle America at all. It might be the bleak, unfriendly place we all wander through, or perhaps the one we carry deep within our hearts. Of course, if you haven’t seen any show lately that’s profound, dark, disturbing and thought-provoking, then you haven’t been to anything produced by Catastrophic. It’s what this company does, and it has been since it rose from the ashes of Infernal Bridegroom Productions, Houston’s long-iconic house of weird and wonderful pain. As so many local theater companies grow tamer, discovering as though for the first time that lighthearted, brain-dead entertainment fills seats, Catastrophic seems to fill enough seats with the absolute opposite. American Falls is a place, presumably in Idaho since Pocatello is nearby, and in it is something that looks like a house. And within this house (or several houses, or dimensions, or whatever), there are people who talk to each other. Or more importantly, they talk as though to the universe, which might or might not be us. There is a story inside this house, and it involves oddness, violence, infidelity, love, hate and suicide, at least some of which have already happened. Though there is no “whodunit” at the core of American Falls, its truth unfolds like a mystery novel, with each layer pulling away to reveal a deeper, ever-darker layer inside. And in the course of the play’s hour-plus single act, we come to realize that five separate vignettes all connect, not placing the final piece in the puzzle until the final seconds. There is considerable adolescent “talking dirty” along the way, plus a lot of laughter at the quirkier aspects of our human condition, all spread over with a brooding poetry that borrows from Samuel Beckett. With Catastrophic artistic director Jason Nodler at the helm, the cast of familiars does remarkable work delivering and, in most cases, livingthe tale Johnson has set down. 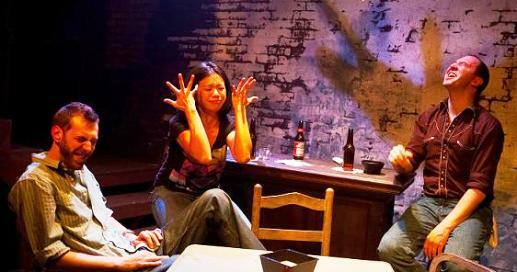 This experience varies from three young adults drinking and telling stories at a table (Troy Schulze, Karina Pal Montano-Bowers and John DeLoach) to an older woman swilling beer and recalling the many failures of her life (Carolyn Houston Boone) to a spirit, ghost or soul of a young woman recalling the events that pushed her to suicide (Jessica Janes). Two especially remarkable performances are delivered in American Falls by Ricky Welch as a spiritual-tending Native American named Billy Mound of Clouds who senses bad things coming, and especially by company stalwart Kyle Sturdivant. To say too much about Sturdivant’s character in this plot is to, well, say too much, but his is a touching, believable and, in the end, heartbreaking turn.